Those foods can be simple, inexpensive, and healthy, no matter when you serve them. Really, it's just a matter of semantics. We'll call the same four ingredients (bread, eggs, cheese, butter) "breakfast" or "dinner," depending on the hour at hand. And yet, somehow, when you're not in college, turning out an omelet past 4 p.m. feels like a small act of rebellion. For some of us, that's reason enough to go for it. But there are plenty of other great reasons to make the most important meal of the day at sundown. In their book Breakfast for Dinner (Quirk, 2013) bloggers Lindsay Landis and Taylor Hackbarth point out that, by definition, breakfast is comfort food, so whether it's pizza with an egg on it or shrimp and grits (both recipes in their book), it's inevitably going to appeal to everyone at the table. Breakfast for dinner is (usually) quick. In my household, the frittata is the ultimate fallback meal on busy weeknights. It's fast to make and it's improvisational so there's no need to consult a recipe, and it's a great way to use up leftover odds and ends. But frittatas are not the only way to save time. Pancakes and waffles whip up in a few minutes, as do French toast and another family favorite, shakshuka, or eggs cooked in spicy tomato sauce. So, when you find yourself with little time and the lack of a plan in the kitchen, these dishes can save supper. Breakfast for dinner means you don't have to wait for the weekend. Maybe you have no time at all for a hot breakfast during the week and you want to linger over a breakfast-like meal. With no rush to get out the door at the end of the day, you can turn out the same egg and cheese burrito, corn cakes, or sweet bread pudding you were craving this morning, along with some home-smoked fish and bacon-infused cocktails. If you have that luxury, go for it. Breakfast for dinner is cheap. Unless you're serving lobster omelets or steak and eggs, you can make a reputable dinner from very inexpensive breakfast ingredients. Eggs, bacon, flour, sugar, a handful of baby spinach, some frozen broccoli, an onion - none of these will break the bank, and you'll still be able to sate big appetites. Breakfast for dinner can come straight out of the pantry/fridge/larder. Most of us have such ingredients as eggs, butter, milk, a few veggies, and some cheese lying around. Decide your menu at the last minute, with no need for a shopping trip, unless you want to get fancy with condiments. Breakfast for dinner is fun. Setting out waffles or pancakes as the last meal of the day shouldn't qualify as a radical act of housekeeping, but somehow, syrup on the dinner table feels wildly novel and enjoyably casual. Kids will welcome the chance to upend the protein-carb-veggie segregation of the dinner plate. Serve them a breakfast sandwich between two mini pancakes à la Stack Happy by Karly Campbell (Front Table Books, 2015) and you're golden. Breakfast for dinner can be healthy. A morning repast in the evening hours can be a lighter option and a way to get some vegetables onto the plate. 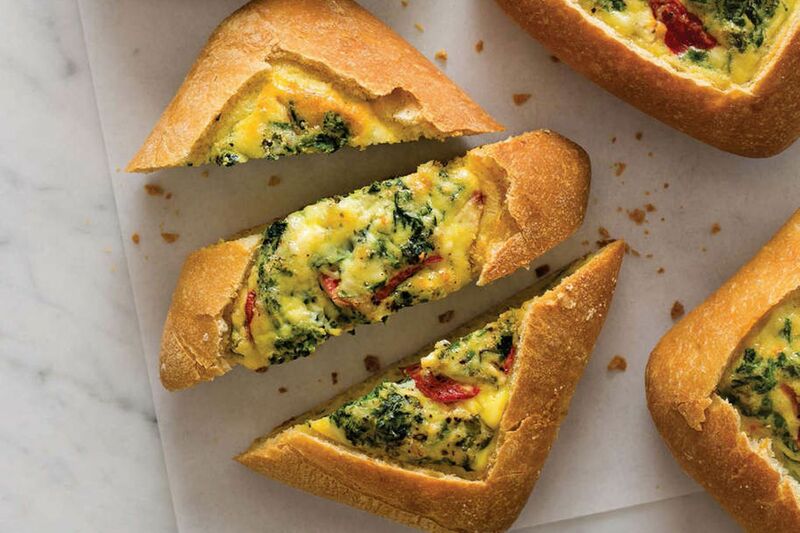 The Mediterranean Egg Boats from The Perfect Egg by Teri Lyn Fisher and Jenny Park deliver sun-dried tomatoes, spinach, eggs, and feta in an adorable little ciabatta-roll package. Savory whole wheat pancakes with vegetables, a salad with a poached egg, even crepes made from alternative flours and stuffed with greens or pesto are wholesome options. Oatmeal and hot cereals with savory toppings are a whole other way to keep it simple and light. Breakfast for dinner can be indulgent. Hey, if you're living on the edge of the griddle, you might as well take a night off from calorie counting. Waffles (Weldon Owen, 2012) author Tara Duggan's salty-sweet bacon-cornmeal waffles with thyme-infused syrup come to mind. Any version of eggs Benedict, anything involving doughnuts, and any use of short ribs therein can also be filed under "I gave up tonight." Breakfast for dinner can be whatever you were planning to eat, plus an egg. Add a fried egg to a hamburger, rice, pasta, pizza, and that counts as breakfast, dinner, brinner, whatever. It can even be a spontaneous act. When in doubt, just serve quiche. Elusive, category-defying custard in a crust knows no mealtime. It refuses to be labeled, and you can follow suit - just call it delicious. 2. Whisk together the eggs, sour cream, onion, tomatoes, spinach, feta, salt, and pepper in a bowl, mixing well. Cut off the top 1/2-inch or so of each ciabatta roll, leaving a 1/2-3/4-inch perimeter around the top, then pull out most of the doughy insides. Place the rolls, hollow side up, on the prepared baking sheet. Divide the egg mixture evenly among the hollowed-out rolls. 3. Bake for 25 to 30 minutes, until the filling is set in the center and golden brown. Let cool for about 5 minutes before serving. Cut each boat crosswise into strips to serve. Note: If you cannot find square ciabatta rolls, mini baguettes - sourdough or French - will work, too. Per serving: 373 calories; 18 grams protein; 23 grams carbohydrates; 3 grams sugar; 24 grams fat; 288 milligrams cholesterol; 1,348 milligrams sodium; 2 grams dietary fiber. 2. Heat a heavy frying pan or griddle over medium heat and add the bacon. Cook until crisp, turning once, 7-10 minutes. Drain on paper towels, then crumble into small pieces when cool enough to handle. You should have about 1¼ cups. 3. Preheat a waffle maker. In a medium bowl, whisk together the eggs, buttermilk, and butter. In a large bowl, mix together the cornmeal, flour, sugar, baking powder, baking soda, salt, and pepper, if using. Make a well in the center of the dry ingredients, then pour in the egg mixture. Whisk until mostly smooth, with just a few lumps. If the batter is too thick, stir in another 1-2 tablespoons buttermilk. Gently fold in the bacon. 4. Ladle the batter into the waffle maker, using ½-3/4 cup batter per batch. Spread the batter so that it almost reaches the edges of the waffle maker. Cook until the waffles are crisp and browned, 3-4 minutes. 5. Using a spatula, remove the waffles from the waffle maker and serve right away, or place on a baking sheet in a single layer in a 200° oven for 20 minutes before serving. Drizzle with the thyme-infused syrup. Per serving (based on 4): 1,079 calories; 53 grams protein; 74 grams carbohydrates; 32 grams sugar; 75 grams fat; 282 milligrams cholesterol; 3,682 milligrams sodium; 3 grams dietary fiber. 1. Heat a large skillet or griddle over medium heat. In a medium bowl, combine the flour, sugar, cinnamon, baking powder, baking soda, and salt. Whisk to combine. In a small bowl, mix together the buttermilk, egg, maple syrup, oil, and vanilla. 2. Stir the wet ingredients into the dry ingredients until combined but still slightly lumpy. Pour ¾ cup of batter onto a heated griddle or skillet. Cook for 3 minutes or until bubbles have formed on the surface and popped. Flip the pancake and continue cooking until cooked through. Repeat with remaining batter. 3. While the pancakes are cooking, heat a nonstick skillet over medium heat, spray with nonstick spray, and crack the egg in the pan. Cook until the whites are opaque and gently flip. Continue cooking until the yolk is as done as you like. 4. Set eggs aside and add the sausage patties to the skillet. Cook them for 5 minutes per side or until cooked through. Top with a slice of cheese. 5. To build your sandwiches, place one sausage patty with cheese on top of half of the pancakes. Place the egg on top of the sausage and then top with the remaining pancakes. Serve immediately. Per sandwich: 506 calories; 24 grams protein; 33 grams carbohydrates; 13 grams sugar; 30 grams fat; 256 milligrams cholesterol; 798 milligrams sodium; 1 gram dietary fiber.